Some people prefer to live in a rural area for a number of reasons. The low cost of living, more ability to focus and pursue creative interests in a relaxed setting, and additional time to explore what really matters in one’s life. If you are the type who strives in solitude and adore the lush environment of greenery amidst a stunning landscape, this type of rural home is for you. This home’s beautiful interior and exterior by Jeffrey Dungan, is a testament to how lovely a reposeful live can be outside the hustle-and-bustle of city living. 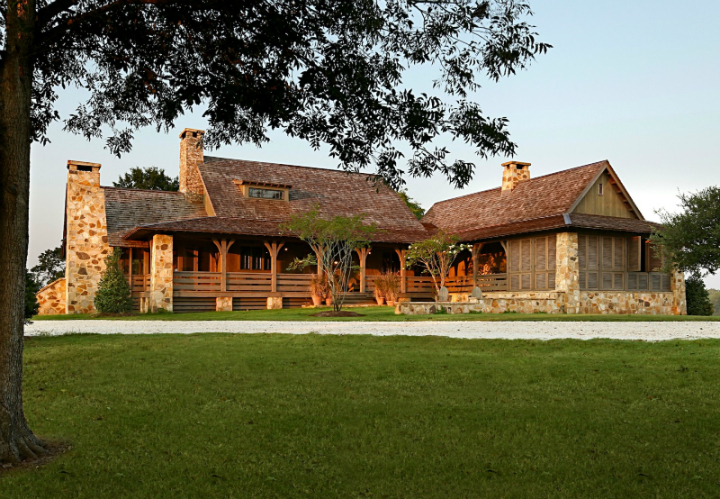 Built alongside a country theme, this beautiful residence embodies traditional concepts with unique structures and textures. 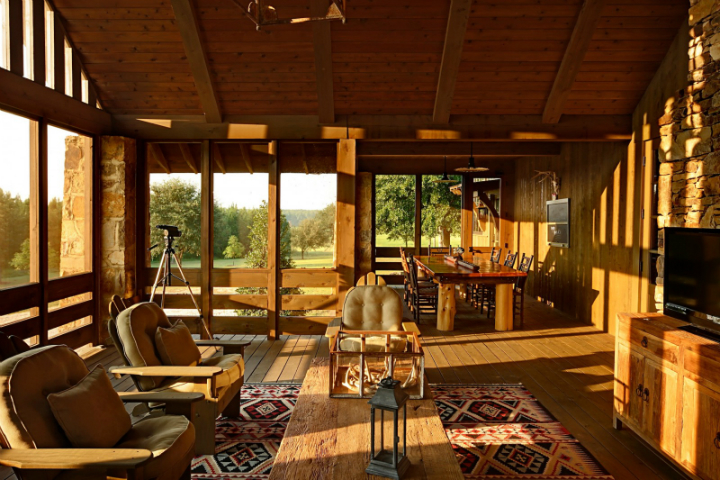 The wrap around porch is emblematic of a style of living that encumbers cool summer breezes and thoughtful repose. Earthy colors are also a distinctive part of this home’s décor. Inside and outside embodies the natural, earthy theme demonstrated with stunning timber and rattan type shades to block the heat of the morning sun. The interior takes on a conventional, modernistic tone. 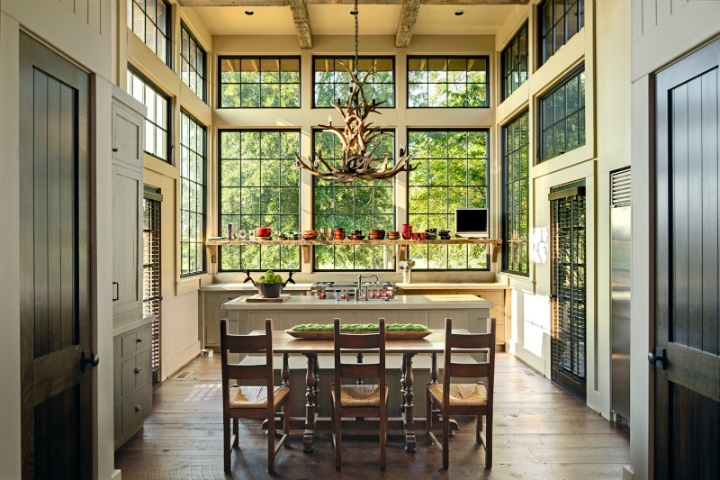 A beautiful kitchen with French paned windows and stainless steel appliances exudes elegance while remaining natural and unstrained. 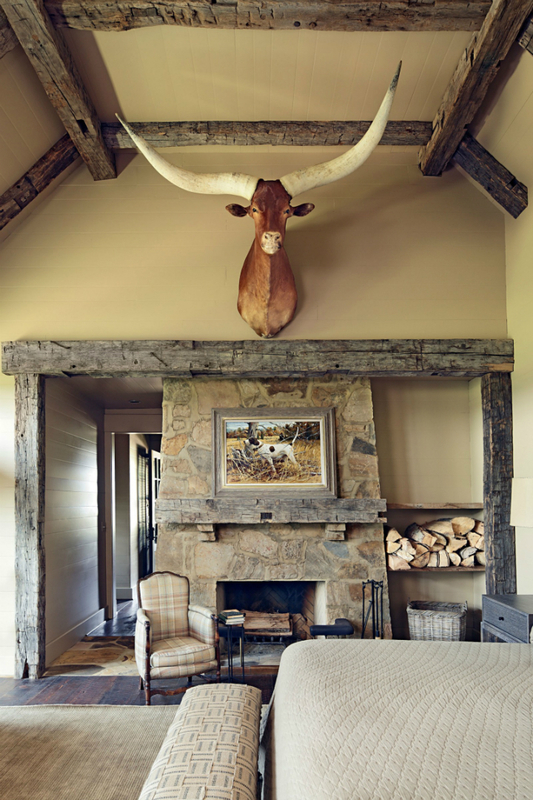 The carved chandelier resembling the horns of an elk coupled with minute accent pieces like clay pots, maintains the naturalistic ambiance that’s so dear to rural living. The living room space is full of soft textures, cushioned furnishings, and exposed greyish natural wood on the ceiling and doorway. The area is quaint and cozy. It’s a place where family and friends gather to talk about their day, their ideas, and their motivations. 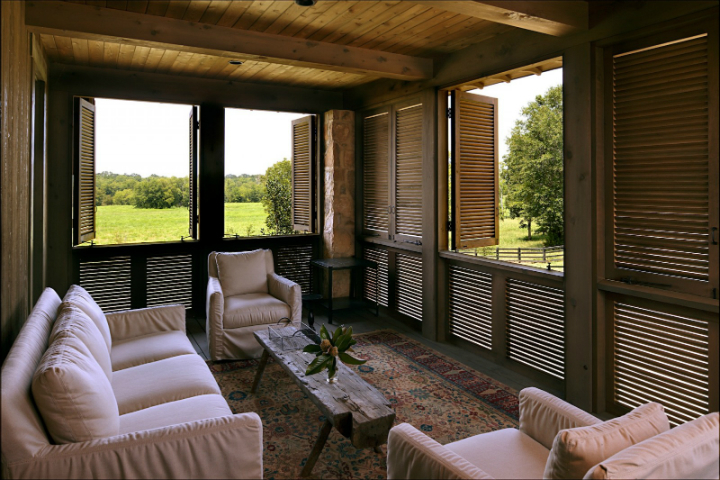 The porch is also a reposeful sitting area where one can enjoy outside nature while protected from the elements, it’s the best of both worlds. A stunningly carved wooden dining table with a glossy finish reflects the morning sun. 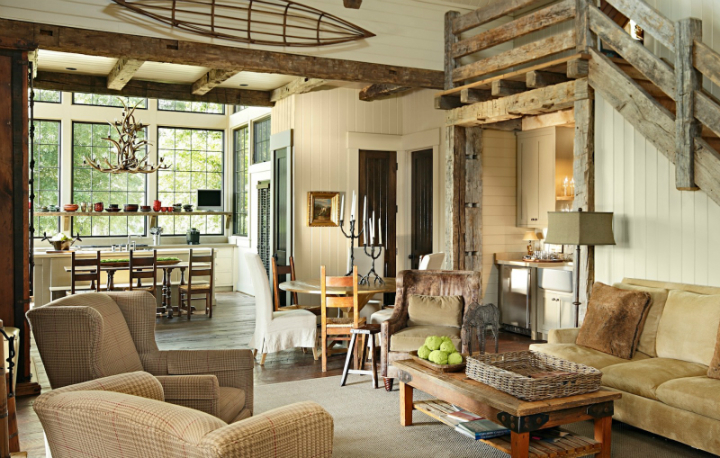 The combination of rustic décor with modern touches such as the flat screen TV are a complementary contrast. Other niches in the home include snug sitting areas that exude an ambiance of comfort and easy living. The décor is meticulous, there’s nothing haphazard about this set up. An open swath of land like this rural area can be an intriguing locality to live in. 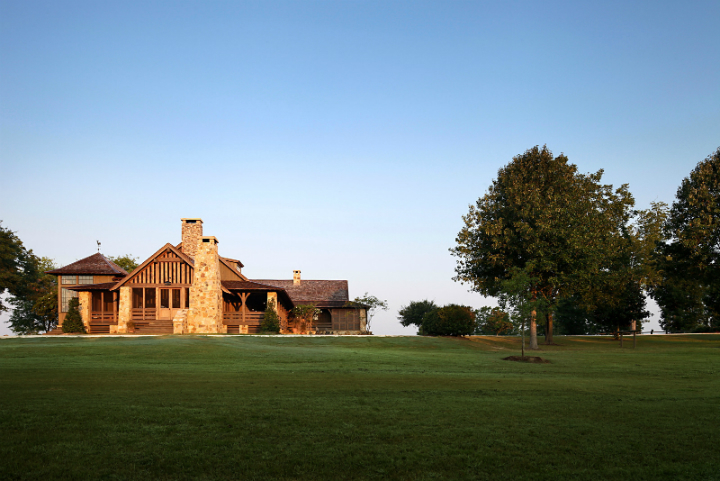 Or, perhaps this is a country home designed for getaways from city life once and a while. Perhaps it is a retreat for meditation and soulful journeys. 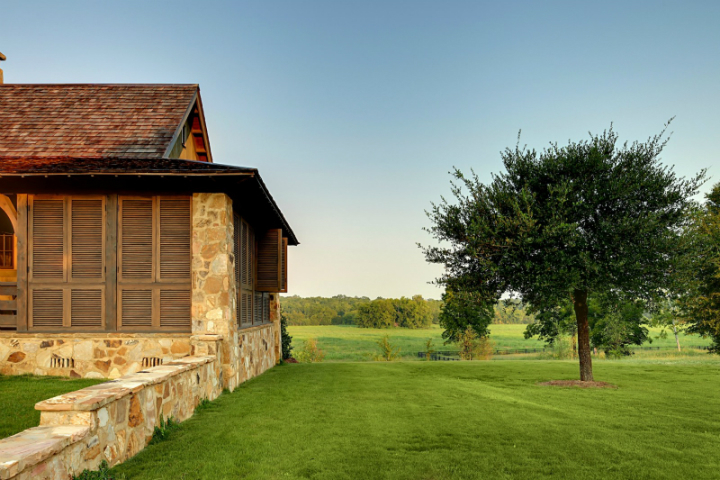 Whatever it is, this domicile is a marvelous example of the allure of country living and how one can still utilize the conveniences of modern day life. It’s easy, it’s cool, it’s chic, it’s everything required to make living grand!